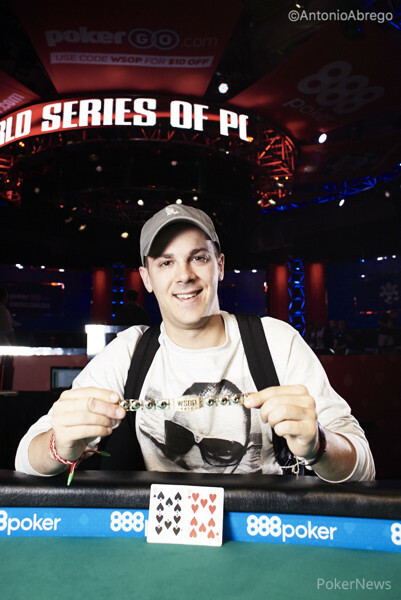 A run of cards that any poker player would be envious of, propelled 2015 November Niner Thomas "FLOATZ" Cannuli through the virtual gauntlet of Event #61: The $3,333 Big Grind Online and into a shiny, new 2017 World Series of Poker (WSOP) gold bracelet. The first ever WSOP.com Online High Roller drew in a field of 424 entries (320 uniques and 104 reentries) and after 12 hours of play, Cannuli emerged victorious to claim the latest bracelet awarded during this summer and the top prize of $322,814. Around the midway mark, about six hours in, Cannuli popped into the top ten chip counts. Not long after, “Roldy” ran ace-king into Adam “HLEDERERER” Owen's pocket kings and the money bubble burst, leaving the remaining 54 players in the money. Canunuli was still creeping around the bottom half of the top ten but soon found himself second, behind Owen. If not for an awful run out while holding pocket aces to Blake "bk1048" Kelso's pair of kings, Cannuli would have had a monster lead heading into the final table. 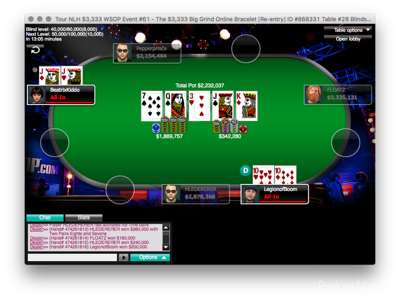 When the final table was set, Cannuli sat in third, behind leader Tara "BeatrixKiddo" Cain and Owen. Millard "Undisputed23" Hale fell quickly, losing a race to Vincent "AllinVin138" Moscati. Cannuli went back to work disposing of Ryan "holdNfold" Jones with the first of his two pocket queens killing pocket kings pots and immediately after, took out “AllinVin138”. Only a few moments went by before Cannuli claimed another victim. This time Kelso held pocket queens, racing against the ace-king suited of Cannuli. Kelso even flopped a set of queens but a flopped flush draw was an easy sweat for Cannuli who hit not one, but two spades to make his flush. Darren "LegionofBoom" Rabinowitz fell in fifth and then things started to go wild. What seemed like two innocent limps at first, soon escalated into a hand that will stand out for a long time. 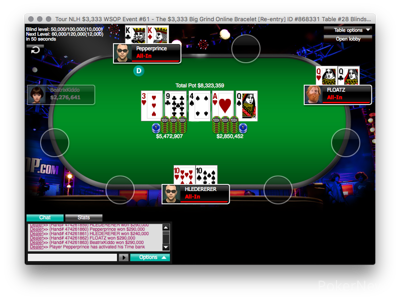 For the second time at the final table, Cannuli got his stack in the middle with pocket queens against pocket kings. This time, Owen was also in the mix, holding pocket tens. Once again, the board ran out in favor of Cannuli who spiked a queen to eliminate Daniel "Pepperprince" Zack and leave Owen in the danger zone. 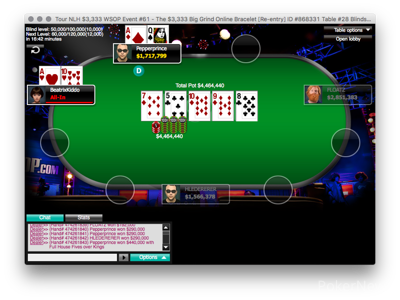 A few hands later, Cannuli got both of his opponents to commit their stacks preflop and eliminated them both in the same hand, holding pocket tens. Though pocket queens will undoubtedly be what Cannuli remembers the most, it was pocket tens that sealed the title, the prize money, and the prestigious WSOP gold bracelet. No need for heads up. "FLOATZ" perfectly wielded the smacking of the deck to eliminate his final three competitors in two hands. Just moments after "FLOATZ" woke up with queens and eliminated "Pepperprince" in fourth place, "FLOATZ" woke up with a hand again and got both of his opponents to commit their stacks preflop. "FLOATZ" could not have asked for a better spot to ship the bracelet but the way the deck had been running, it wouldn't have mattered what two cards he had. The final board ran out . 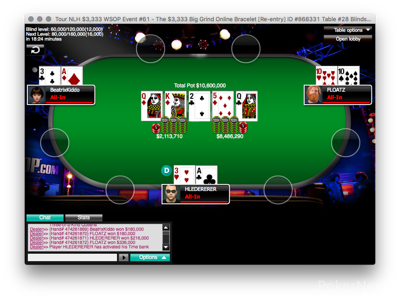 "HLEDERERER" was the shorter stack bagging third place for $136,231. For the runner-up, a prize of $201,408 was given to "BeatrixKiddo". 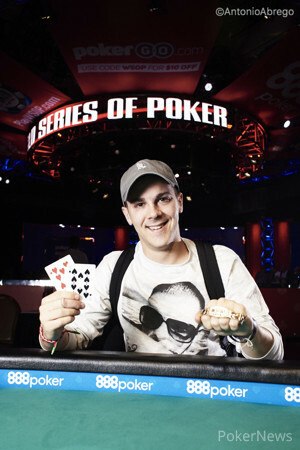 And for the champion, "FLOATZ" was awarded $322,815 and of course, a shiny, new WSOP gold bracelet. When you run good, things just happen. "Pepperprince" limped on the button. Sitting in the small blind, "FLOATZ" also limped. "HLEDERERER" raised to 333,333 out of the big blind and "Pepperprince" just flatted. "FLOATZ" then three-bet shoved for 2,854,910 and both, "HLEDERERER" and "Pepperprince" snap-call. "Pepperprince" had 1,810,969 and "HLEDERERER" had them both covered with 3,617,480. Incredibly, "FLOATZ" and "Pepperprince" slow-played their monsters and all the chips managed to get intot he middle. "FLOATZ" had already sucked out on pocket kings with queens earlier on at the final table and sure enough, once again, a massive pile of chips slid "FLOATZ's" way when the board ran out . "HLEDERERER" was left with crumbs while "Pepperprince" had to drown his sorrows else where, falling in fourth place, picking up $97,232. "HLEDERERER" moved all in preflop and was put at risk by "Pepperprince". "HLEDERERER" was quite behind with against the of "Pepperprince". The board, however, had other ideas and ran out giving "HDLEDERERER" a full house to vault into the chip lead. "BeatrixKiddo" open-jammed from the cutoff and "Pepperprince" was at-risk with a call from the button. The board ran out and a ten on the flop held through the turn and river to give "BeatrixKiddo" a huge double up, right into the chip lead. With only ten big blinds behind, "LegionofBoom" three-bet jammed all in from the button and "BeatrixKiddo" four-bet all in over top. "FLOATZ", the original opener, folded. The board fanned out and "LegionofBoom" departed in fifth place, earning $66,112. Hot "Diggity" Dog, What a River! Pair of Kings for "WushuFTW"